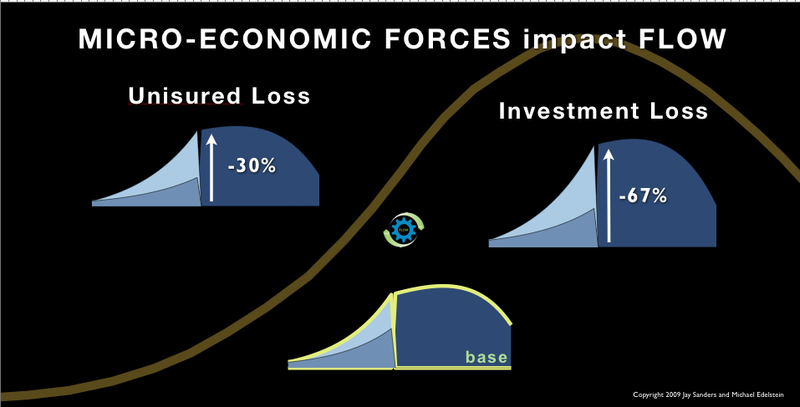 Curve Components – Part 3 dealt with the impact of economic factors beyond our control. This post discusses two common factors within our control but just like the macro forces they too can cause major curve damage, uninsured loss and investment loss. Uninsured loss can occur when insurance coverages are too low, overlooked or dropped. By comparing annual premium dollars to coverage amounts you can quantify the risk to your curve from being underinsured. For example, lets take home owner’s insurance for single family homes. According to NAIC in 2007 the average premium was $822 while the average single family home was worth $235,000. That comes to .35 cents per dollar of coverage. Losing a $235,000 home for $822 is going to do a lot of damage to your curve. Other types of insurances may run closer to 3 or 4 cents premium per dollar of coverage but you get the point. Skimping on insurance can be a big mistake! Investment loss most often comes from lack of investment savvy. I say that based on studies of average investor returns versus market returns. The one I like most is the Dalbar QAIB which stands for quantitative analysis of investor behavior. The most recent study states “since 1994 the following key findings remain true, investment results are more dependent on investor behavior than on fund performance and mutual fund investors who hold on to their investments are more successful than those who time the market.” In number terms the average investor earns between 25% to 30% of the market return. Ouch!